It’s Summer Down under and we have been having some of HOTTEST days on Record. You want to Buy a Stand Up paddle Board but have No idea where or what to look for. Race, Fitness, Tour or just good old general paddling what is right for you? You have started your search for that new board and the first thing that happens is you get overwhelmed with the amount of boards on the market with 50 different shapes and styles not to even mention constructions!! In this Write up we look at what boards do what and when each board might be used and what that board should be used for or what purpose. Lets start with the very basic and head on through to some of the more specialised. We will only cover hard boards in this review so sorry no inflatables here!! So you have typed "stand up paddle boards" into Google and BAM 50 different boards are now on your screen. So lets take a step back a little and first work out what you will be needing a SUP for. You need to break all of this down and be honest with what you are needing as one of the biggest things we see is people buying the wrong board for what they want. Now this is the most basic type of paddling and more than likely what you first seen when seeing someone doing it at the beach. In this class you really need to look at the largest person who will be using the board as the lighter people will in most cases always be able to paddle a bigger board but the heavier rider will really struggle if the board is to small. In this case you will more than likely be looking for a board between 9ft to 11ft and 30 to 34 wide, just remembering that length gives you speed and width gives you stability. The boards in this class can vary and in many cases you do not need a $2000 board so always weigh up how many times you will be using it in say a month. As a guide if its might only be used once or twice a month then a cheaper board might do the job perfectly, if you are planing to use the board say two times a week or more then you might want to look at something better quality and look out side of most boards made in China. Also think about the people who might be using the board and if you have a lot of heavier riders then you will definitely be looking for a better quality board, you will need a board with the deck reinforced at the minimum. You need to ask a few basic question like are the fin boxes and handles all reinforced? ask for proof if you don't trust what they are saying as if they have a good product then they should be able to show what is inside the board away from a pretty paint job. Don't get sucked into buying to small of a board if it is just for fun as well, this is a trick a lot of shops might use to make a board cheaper as smaller boards cost lees to make and to a lot of shops a sale is a sale and they could care less if you walk out with a 8ft board when really you needed a 10ft board!! 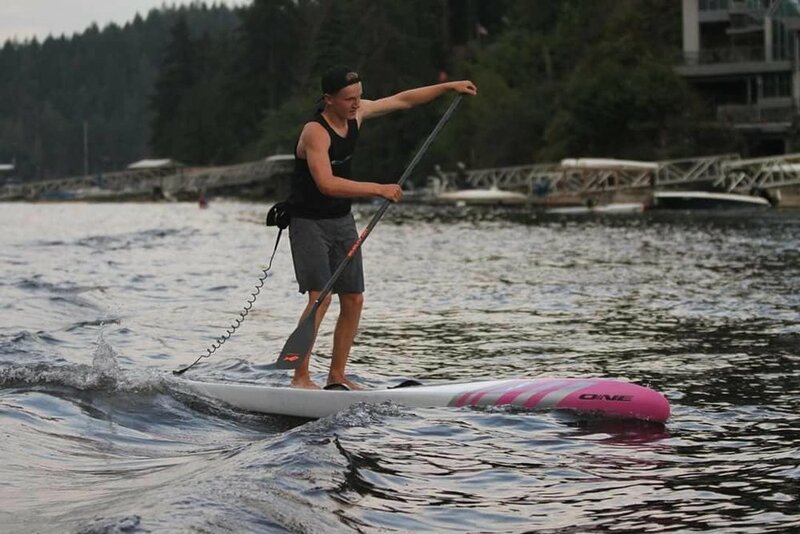 This is a class or side to SUP that is really getting more and more popular, since on a SUP you can access areas that are hard to get to buy car or boat and the fact it is super quite and relaxing makes for some super fun paddles. So what kind of board works for this? Well really any board will do the job but at a minimum we would say 10ft is as short as you really would want to go unless it is a Touring specific board which might allow for a smaller design. Although a standard 10ft board will do the job a board specifically built for touring would be far far better. Touring boards are in most cases 12ft to 14ft and range in width from 26 wide to 32 wide and in most cases have lots of tie down points on the deck so you can store bit and pieces you might need on your long paddle. Construction wise you really need to look at the terrain you might be going into and we recommend the stronger made boards such as the molded line in the ONE boards and since you will be just cruising along you can also get away with a bit extra weight like in the Hybrid construction. Some companies also have specifically designed smaller Tour boards for Women such as ONE 9ft x 30” Tour board, mostly as there is also a need for ease of use for Women. 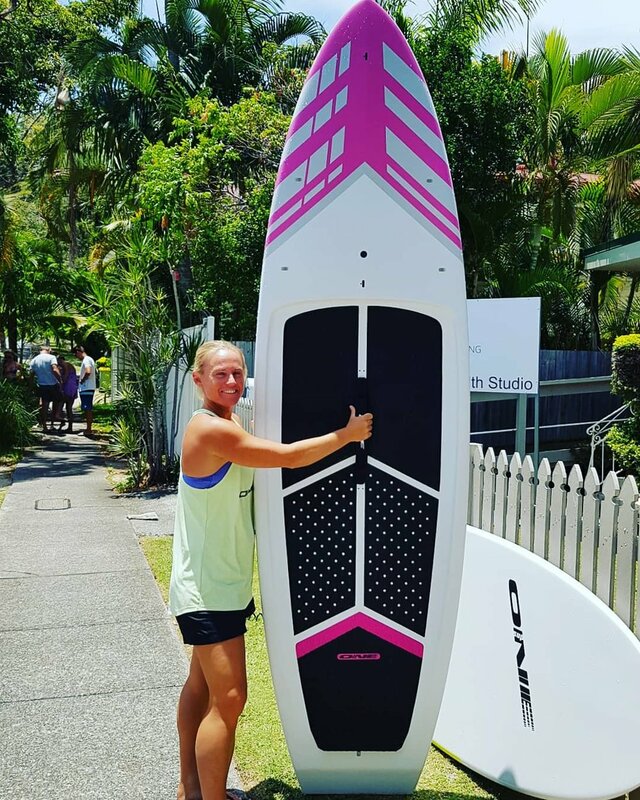 A board such as 9ft Tour board can fit inside most cars allowing Women to go anywhere and paddle on their own without having the hassle of big Tour boards on top of their car. We will group these two together as the boards used can be very similar. Now you could use your cheap 10ft board and get a workout but the difference between a 10ft board and 14ft board that is specifically made for Racing or Fitness is HUGE and once you paddle the longer boards you will never want to paddle the shorter 10ft board again. In many cases shops will sell you a 10ft board even if you say you want to use it for fitness just because 10ft boards are cheaper and a easier sale they don’t really care that you will only do it once or twice and then just give up because it sucked and you could not keep up with other paddlers. The fitness and racing sides of SUP are one of the most exciting parts of stand up paddle and getting in to this will open up a whole new world that will give you a full gym work out but in the best place on Earth 'in the WATER"
Now boards for this can really range in both price and performance so you really have to look at where you will use the board the most. You have to make sure you understand what you ability is and understand that yes narrower boards do go faster but only if you can stay upright on them and get good power stokes in, we recommend to go a little wider for a first board and learn all the basics, if you are unsure of what is right then you can get good all round race boards like the EVO 2.0 which is designed to cover most bases of water types. Constructions can vary but one thing is for sure in this class and that is stay away from the CHEAP race boards, look for brands that do a lot of testing and can show there boards in the conditions that they are designed for. 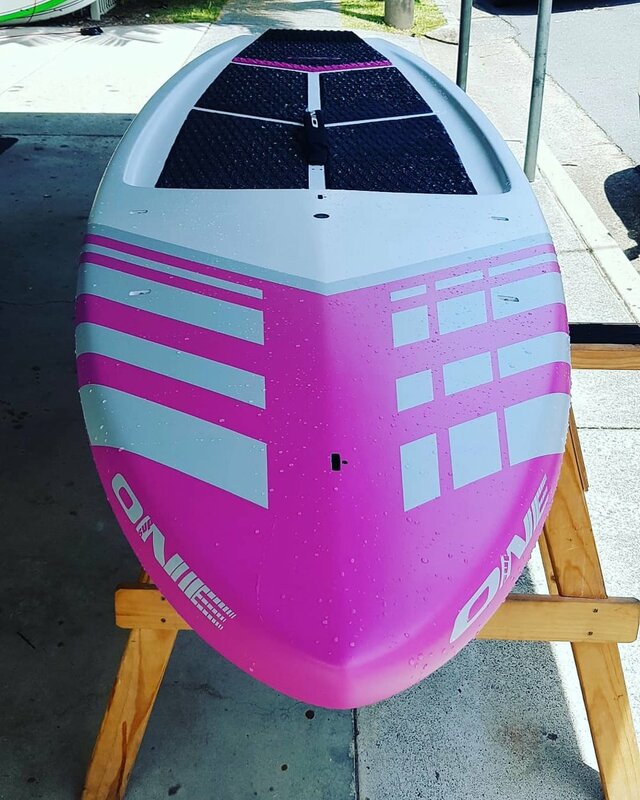 When looking at construction Carbon is good but can be a little more fragile and with most race boards brands are always trying to get the weight right down so keep this in mind and if the board is super light then make sure to ask why? the exception to this are boards like the EDGE 2.0 and EVO 2.0 which are a PVC Wrapped Molded boards which offers amazing strength to weight ratios and the only difference between the cheapest and most expensive in these ranges is weight as they are all super strong so the more you pay the light board you get. The biggest thing we always like to say to our customers is, ask questions about what you are about to buy. There are a lot of cheap boards on the market these days and in a lot of cases there is a reason why those boards are so cheap and its not always good!! Also many retailers are only interested in Selling you a board because of this you can walk out of that retailer with the completely incorrect board. You will be putting a lot of trust in your retailer so make sure you ask all the questions. If you ever need any advice then always feel free to contact us here at ONE and we will always tell it like it is and leave the sales crap to others who need it.